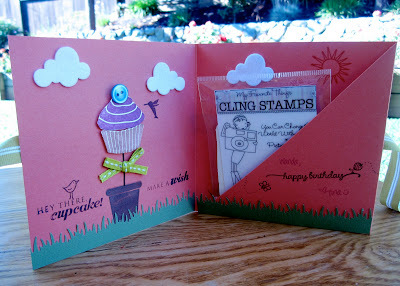 Last week was Wanda G's birthday and I sent this totally cute stamp set from My Favorite Things to her. She's a fabulous photographer and I thought this was the perfect set for her! I wanted to somehow package the stamps along with a card as a combo. 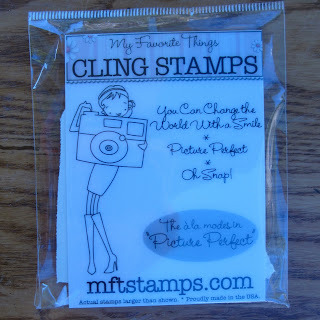 This is actually a paper CD holder I bought from Paper Source but I think this stamp set looks much cuter in it, don't you think? 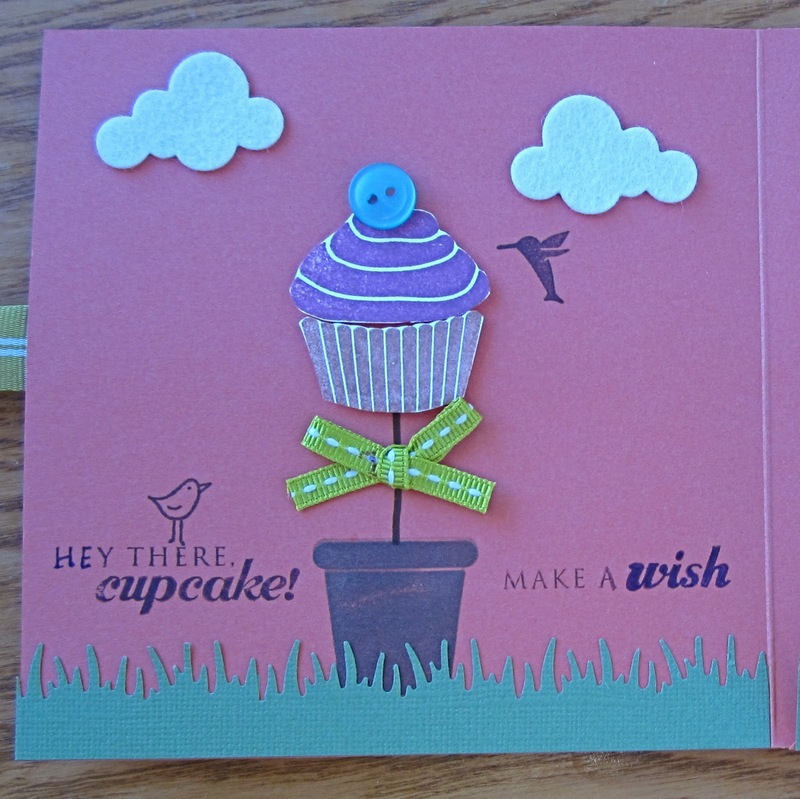 I couldn't leave the left side blank so I thought a cupcake topiary would look good on it since I didn't get to see Wanda on her birthday to give her a real cupcake! I decided to make a scene inside the card folder so both sides would flow together nicely. I used the grass border punch by Martha Stewart for the bottom part. The clouds are made with felt using the cloud dies by Papertrey Ink. This cute digi image is called Cupcake Anya by The Greeting Farm that I colored with my Copic markers. For the shimmery green cardstock, I used the Cuttlebug dotted swiss embossing folder to give the background some texture. I attached a long strip of ribbon around the folder so I could tie it closed. Finally, I had to spice up the large scallop circle by putting sparkly diamond bling all around it. Sometimes it's no fun at all when I want to get my craft on in the studio but I gotta get loads o' laundry done! Today happens to be that day to do it...otherwise no one will have clean socks to wear the next day! The weather was a bit overcast when I took my pics so you may not see all the details. I took a cream card base and randomly stamped tiny flowers all over the front. 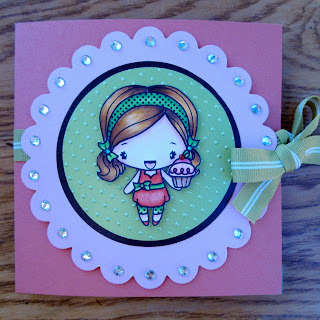 I colored the cute girl holding the tall ice cream cone separately on white cardstock, paper-pieced her dress using the cutest cherry blossom patterned cardstock ever from Paper Garden, cut the entire image out and attached it to the solid cream oval. I used different colors of Spica Glitter pens for all the scoops of ice cream...gotta make them sparkle, ya know! Since this card was for a crafty person, I repeatedly stamped the paint can and brushes images with two coordinating colors for the inside of the card. I think stamping one a different color gives an added interest and draws your eye to it. I finished the front of the card up using thin cotton yarn I found in the knitting section of the craft store. I tied it around the cover a few times and tied a bow. I like using this yarn sometimes because the weight of it is a little thicker than baker's twine that seems to be popular these days. Well, I'm off to start another load of laundry...I'll be back when I fold the last shirt!